We’ve talked in some earlier posts about the cutbacks at The Times-Picayune (TP) in New Orleans, the local reaction, and what it may mean for the publishing industry and the future of news reporting as a whole. While this week’s news that the TP’s award-winning Katrina reporter Mark Schleifstein is staying with the paper after the restructuring is encouraging, the paper’s fate still remains unchanged (despite strong local opposition), prompting criticism and gloomy predictions of the state of journalism in general. The main reason that newspapers are failing in this country is that they are being set up to fail by publishers who think like hedge fund cowboys, and by editors who think like corporate officers. If there’s another major institution in this country that hasn’t yet gone out of its way to fail the people of New Orleans, I don’t know what it is. Perhaps sports fans needn’t worry as much as the readers who want to keep up with the coverage of local politics, schools, and any other social issues. 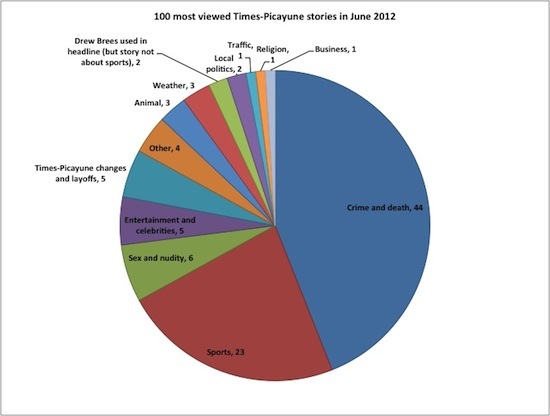 Together with TP’s online editor Cathy Hughes, Carr compiled and analyzed data for the stories that have received most pageviews (see chart below for the June 2012 data). The 100 most popular stories that month included no coverage of education, health, immigration, or housing. Less than 10 percent of the stories were even tangentially related to social or public policy. Only two addressed a serious political debate (and one of the two probably made the list simply because Drew Brees was mentioned in the headline). But the stories documented murder, mayhem, and mischief in abundance. As a chronicle of human cruelty and misfortune, the list was nothing short of sublime. And while NOLA Media Group hasn’t explicitly stated whether it will focus on the clicks-driven coverage, the mere fact that, according to Carr, the company “left the sports and entertainment departments comparatively intact” while other departments have suffered drastic cutbacks, points to where its priorities are. We would know all there is to know about Drew Brees’s contract and the most sensational of the city’s homicides, but much less about everything else. If clicks drove coverage on the education beat, not only would reporters write less about the city schools, they would focus disproportionately on what I would describe as micro-feuds — intense, bitter, and divisive issues that are relevant only to a small fraction of society. Carr’s main point seems to be: Yes, we’re driven to the sensational journalism due to our (human) nature, as well as the news that might directly affect us, but that shouldn’t be the focal point of a local community paper. Instead, its function is to help us “understand the more subtle and important ways in which policy connects to our daily lives.” Which doesn’t always fall under the news coverage that will get the most clicks. 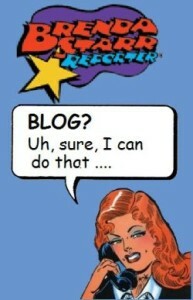 Image of Brenda Starr is by Mike Licht, NotionsCapital.com, used under its Creative Commons license.